One thing that is vital to the integrity of your FileMaker relationships is the data entered into your database. Another way to put it is that bad data entry and make your precisely defined relationships behave as bad and poorly defined ones. One of the main enemies is the incomplete record, where data is not fully entered. So let us imagine that a user with basic security access to a database starts to enter data into a record and then decides against it. Now this user, does not have security access to delete a record. To make the problem worse, there are fields that have validation setup so they cannot be left empty. So the user has no choice but enter data into those fields to get out of the bogus record. So fields that are looking for key data may have values in them such as ... or blank spaces. The blank spaces will be viewed as data in the field via validation but do not have any value for the record. In FileMaker 6, developers had a devil of a time trying to work around these situations. They would build ways for the user to flag a record for deletion or build odd submission type systems using global fields or related fields. Now let us fast forward to FileMaker 7 - FileMaker 9 and its impressive number of little things that make a big difference. 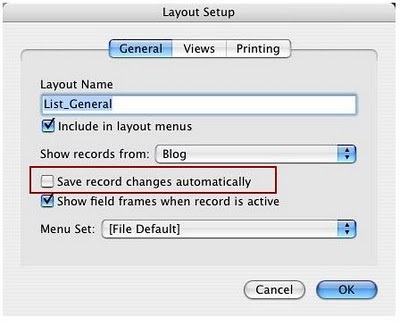 In the layout setup box, there is a small check box for saving records automatically. When unchecked, the user has to verify they want what they typed saved into the system. This can be a way out for those basic level users and help keep the database free of record clutter. Here you can see the setting in the layout setup for saving record changes.